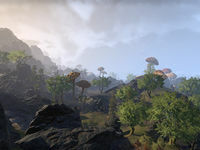 The Grazelands are the northeastern pastoral heartland of Vvardenfell. The region extends northwards from the ancient Dunmer stronghold of Falensarano on the edge of Molag Amur to Vvardenfell's northern coast. The Zainab Ashlander Camp and the village of Vos lie in the region, and the Telvanni wizard tower of Tel Mora sits just off the coast. This page was last modified on 19 March 2018, at 05:27.